• Tired of cheap pencil sharpeners that fail and break within months? • Looking to steer clear of bulky, noisy pencil sharpeners? • Made for the needs of teachers, artist, students and office workers in mind. 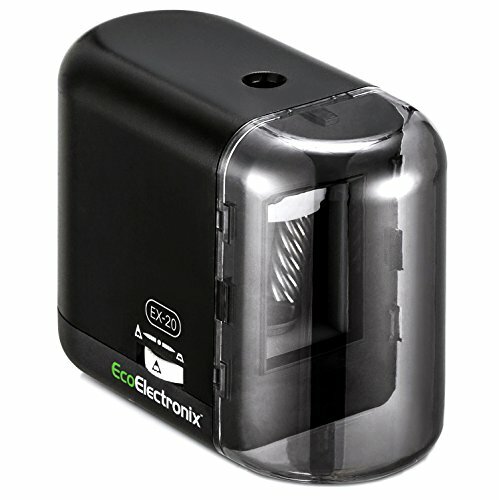 The EX-20 Electric Pencil Sharpener gives the best in performance and durability. Crafted from high-quality materials and sustainable manufacturing practices, it does the job right, every time. • Conveniently Powered by AA Batteries, Included AC Power Adapter, or even a powered USB Port. Perfect for standard and artistic sharpening. Use the built-in Point Adjuster Wheel to get your perfect point. Ideal for daily writing, drawing, and shading/coloring. • The innovative, auto-stop safety feature prevents this pencil sharpener from being used if any part of the assembly is missing. That means no hurt fingers, which makes it an ideal choice for classrooms with young kids. • The EX-20 pencil sharpener tackles colored and soft lead pencils with ease. Looking for a colored pencil sharpener? This is it! Looking for a solid standby to sharpen No. 2 pencils? It does that too! • Built-in Pencil Sharpness Selector. Choose from Ultra-Sharp to Blunt, and every sharpness in-between. • Green LED Light lets you know when your Pencil Point is Perfect. • Lifetime Warranty Policy from EcoElectronix. ✅ COMPACT, HEAVY-DUTY & QUIET: Made specifically for teachers, artist, students and office workers alike. The EX-20 Electric Pencil Sharpener offers 40x longer blade life, and the best in performance and durability. Crafted from high-quality materials and sustainable manufacturing practices, it does the job right, every time. ✅ LIFETIME WARRANTY: Your purchase is backed by our Lifetime Replacement Warranty. If your EX-20 pencil sharpener ever has an issue, just contact us for a free no-hassle replacement, guaranteed. We respond to all inquiries within 24 hours. ✅ PRECISION SHARPENING, FLEXIBLE POWER OPTIONS: Conveniently Powered by AA Batteries, Included AC Power Adapter, or even a USB Port (2.1V). The built-in Variable Sharpness Selector allows for quick and easy artistic sharpening options. Ideal for No. 2 pencils, colored pencils, daily writing, drawing, and shading/coloring. ✅ ADULT & CHILD FRIENDLY: The innovative SafeSharp safety function prevents this pencil sharpener from being used if any part of the assembly is missing. That means no hurt fingers, which makes it an ideal choice for classrooms. Anti-skid feet keep this sharpener in place during use, while also reducing noise. ✅ AUTO-SHARP LIGHT INDICATOR: Built-in LED Light indicates when your pencil is completely sharpened. Sharpening motor automatically shuts off when the perfect sharpness is reached. The EX-20 can tackle colored and soft lead pencils with ease. Looking for a colored pencil sharpener? This is it! Looking for a solid standby to sharpen No. 2 pencils? It does that too! If you have any questions about this product by EcoElectronix, contact us by completing and submitting the form below. If you are looking for a specif part number, please include it with your message.